The essential destination for all professionals seeking information on what is already the vine and winegrowing world of the future. The Institut Français de la Vigne et du Vin (IFV), the Institut National de la Recherche Agronomique (INRA), Montpellier SupAgro, the Institut des Hautes Etudes de la Vigne et du Vin (IHEV), IRSTEA, SUDVINBIO, the Occitanie Regional Chamber of Agriculture and the AgriSud-Ouest Innovation competitive cluster were gathered together for SITEVI on a joint "Research and Innovation" stand. These scientific and R&D organisations which work together on innovative projects for the sector's firms, both in winegrowing and winemaking, mobilised specifically for this edition of SITEVI to present the major challenges that winegrowing is likely to be facing tomorrow. Explanatory display boards offered visitors insight into all the latest research by these bodies and its practical applications. Tasting sessions of new disease-resistant grape varieties were also held in the stand's tasting area. Short talks lasting 20 minutes gave visitors a chance to ask scientists questions on subjects such as climate change, the Digital Mas, "wine and vine" MOOCs and organic winegrowing. 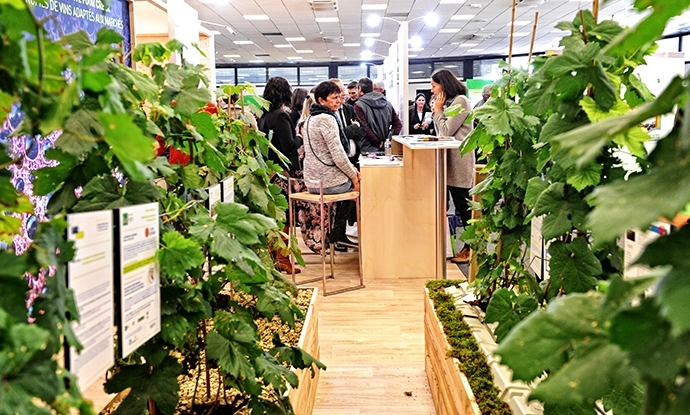 Another original highlight of the stand: on a life-size grapevine, IRSTEA AND IFV revealed to visitors the "Paillis Symbio" (Symbio mulch), a polypropylene tile which eradicates 100% of weeds, conserves moisture in the ground, activates biological soil life and reduces runoff.